Of what kind is the world that surrounds us? Where are we located? And which are the extensions of our physical shape? Digital Bodies shows explorations, journeys and trips to distinct realities. The art videos and experimental films deal with environments – existing ones, familiar or far away, fictional, or places of the past. The protagonists are captured in a multi-facetted world and create a connection between real eyes, human flesh and digital bodies in digital films. 2013-2016. Curated by Alisa Berger. Thursday, April 14, 2016: 6:00 p.m.
Friday, April 15, 2016: 7.30 p.m.
Saturday, April 16, 2016: 7.30 p.m.
Sunday, April 17, 2016: 6.00 p.m.
‚Desert Miracles‘ is a cinematic exploration of a commercialized architecture of desire. Across 22 different tableaus the film meditates upon the interiors of Nevada’s wedding chapels, considering how the excessive scenery opens up to constitute a cultural organisation of “Love”. A woman’s’ voice is heard reading out an ambiguous letter to an unknown lover in which she finds herself troubled by the challenges of modern relationships, unable to negotiate a balance between self-fulfilment and optimization. The text is based on anonymous posts by different women in various internet wedding forums. One fictional female character is composed out of many assembled perspectives on desire, relationships and social expectation. Window Shopping ll indicates and captures subtle notions of cultural and social conventions in the realm of public showcases. Diverse fragments of public displays in Tehran (an Eastern City) and Cologne (a Western City) are comparatively observed through a rhythmic montage. Window Shopping ll is a twofold essay on cultural and personal identities, in between the public notion of east and west. The film also evokes the personal narration of a journey. Merely through the tandem images of windows, the film calls into question the personal perception of a culture in relation to one’s identity. Clothing items, mannequins, lighting and backdrop, as well as the supposed viewer position of each window reveals characteristics of the two cities accordingly. Furthermore, the relationship of each culture to aesthetics, gender and consumerism is present. The film reflects on conception of public or private, East and West, gender, as well as personal and cultural identity. Who is the evil? Is it me? Or you? The other? Interweaving documentary images from the two matrilineal tribes of the Moshu (China) and the Kuna (Panama) this film connects alleged female societies from continent to continent. The link between these two worlds is the filmmaker herself, trying to cope with the otherness of what is seen and the strangeness of the inner experience. The single channel video STICK IT combines television footage of women’s gymnastics with recordings of myself attempting the same routines. Merging myself and the young gymnasts of the 1996 Olympics in Atlanta into one composite character, I enter an ambivalent position between envy, identification, rejection and critique of these highly controlled bodies and their restricted performative roles. The video follows the preparation and execution of a floor routine, suspending the marginal moment right before the action, encapsulating ambition, the pressure to succeed and the looming possibility of failure. The video Inland Freaks explores the particular atmosphere of family relationships. Oscillating between intimacy and distance, brother and sister trust each other just enough to be honest, demanding and unfair to each other. They want to confess to each other that they are not human and that they have known this about each other all along, but they don´t know how to start. By collaging fragments of authentic dialogue with scripted fictional elements the boundaries of what is real and what isn’t become blurred. 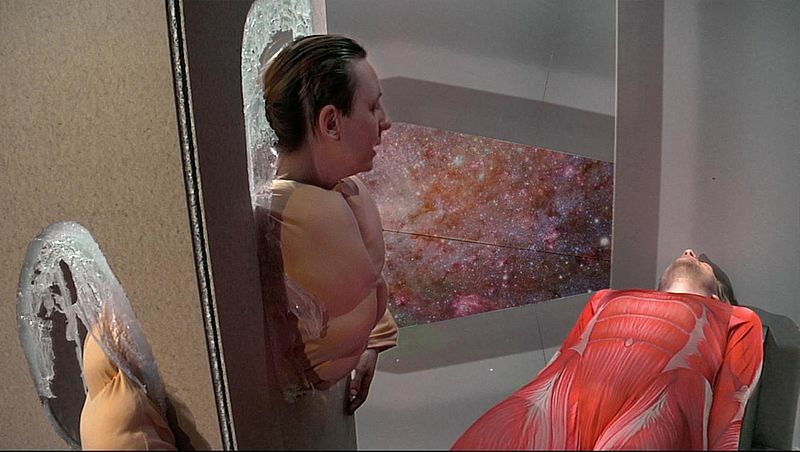 The melodramatic encounter takes place somewhere in space, but the illusion of a three dimensional space is constantly disturbed by the camera zooming in on the surfaces of objects and bodies. Nothing stays the same—both the bodies and the environment they inhabit perpetually implode and explode into one another. The film “Rest in Me” describes an everyday routine oscillating between devotion and surrender. Malz’s rapid rhythmic montage of found footage from feature films from over the last twenty-five years chronicles in visual terms the increasing outsourcing of physical presence in favour of virtual identity. What began as the opening up of the world through the internet has mutated into an increasingly comprehensive encryption and surveillance of the individual subject. For the project Polarflux Sebastian Thewes was concerned with the topics landscape, wilderness and nature and our relationship to it and the way we are picturing and documenting it. Sebastian Thewes traveled to the polar region in the northern Scandinavia to collect photographs and audiorecordings from the unique landscape of the region above the polarcircle. Awakening is an ongoing hybrid piece at the border between happening, internet art, installation, staged documentary and performance, trying to blur the line between artistic action and real experience. In the videoloop Awakening I, the origin of the piece as a whole, we use texts from pop-songs and photographs that we found online. The call to personal enlightenment consists of quotations such as “You can see clearly now”, “the rain is gone”, “Come as you are”, which seem to be translated live into sign language. By merging pop-cultural elements and new-age aesthetics, a new functional and perhaps ironic layer of narration is created. In the pulsating metropolis of Berlin, the artist Britta Thie and two of her friends paint the portrait of artists inspired by the development of digital technology. The series examines how the Internet has become a natural working environment over the past years and how it has changed human interaction. Nowadays, communication and creation are inherent to digital devices which change our intimacy and emotions. With her friends, Thie questions ironically the consequences of this world stimulated by social networks and unending updates. Britta Thie produzierte zuletzt für die Schirn Kunsthalle Frankfurt die autobiografische Webseries „Translantics“ und führte sie als Einzelausstellung im Kunstverein Göttingen installativ weiter. „Translantics“ wurde als Portrait einer selbstbezogenen Kreativgeneration kontrovers diskutiert und zu Festivals in u.a. New York, Paris und Berlin eingeladen. Friday, April 15, 2016: 4:30 p.m.
Saturday, April 16, 2016: 4:30 p.m. Produced by Artists’ Association MUU, Performance Voyage 6 is a series of international video performances that will have its world premiere at the Finnish Institute in Stockholm from 11 March to 9 April 2016. The show comprises 17 works by 17 artists or groups. Performance Voyage 6 has three facets – the exhibition, a world tour, and a DVD publication. The works were selected by a jury composed of Annette Arlander (artist and professor), Juha-Heikki Tihinen (curator, Pro Artibus Foundation) and Timo Soppela (director, MUU). The selection of works in the series attests to the many ways in which performance art can make us see things with new eyes, sensitise us to perceive change and meaning. In the shorter works, a state of affairs changes into something different and evokes a sense of wonder, in the longer pieces new worlds open up more slowly, with the viewer sharing the same time and pace with the work. The selection reflects diversity and future visions in wildly different ways. After the exhibition, Performance Voyage 6 will go in a world tour that covers several countries including Germany, Italy and the United States. In 2016, the Performance Voyage 6 compilation will be presented internationally in 15 different locations, including Scandinavia, Continental Europe and Canada. PERFORMANCE VOYAGE SINCE 2011 – The Performance Voyage project was launched in 2011 as an ancillary event of the Amorph! festival. Since then it has become a staple part of the annual project operations of MUU, and it has increased in prominence every year. The purpose of the Performance Voyage project is to record and document transitory performances and thereby to extend their life also beyond the moment itself. Montreal-based artist Caroline Blais studied cinema, graphic design and languages in Montreal and Lapland. Her art practice situates itself at the intersection of art and graphic design, often shown in the public space. She gets inspired by the everyday life, people she meets and travelling in unfamiliar places. Ball Don’t Lie is the representation of a contemporary oracle. Questions about the future are made. Ball answers to them. Roberto Fassone lives and works in Florence, Italy. Part of his research focuses on making simple artworks that can be explained in few words. The other part of his research consists on explaining how to make these type of artworks, but it is impossible to describe it in few words. A film by Andrew de Freitas is scored by Hidrogenesse, and filmed in Hội An, Vietnam. Andrew de Freitas uses a wide range of tools and production processes in order to explore the peculiarities embedded in everyday experiences. His activities often reconfigure the materials and information surrounding existing situations so that our relationship with otherwise familiar objects, events and situations is altered or challenged. He studied art and philosophy in his hometown of Auckland, New Zealand, as well as in Canada and later in Frankfurt am Main as a student of Simon Starling and Peter Fischli. Currently lives and works in Rio de Janeiro. James Duesing is an animator and professor at Carnegie Mellon University. His animations have evolved from hand drawn and early digital forms to 3D and motion capture. The moment of now – Henri and his endless search. When is the right moment and how can one recognize it? Time, space, rhythm, and being present. Henri Hütt is an artist/performer who values hybrid connections in arts. He formed Distant Artist position before the popular Nothingness trend and deals with the introvert exotics of “not”-polarities. During past years he has been intensively focused on concepts as “Stage​d exhibition” ; “Absent theatre” and “Pre- and Post-performative variations” (in its widest sense) Vanity and ambition forces him to move towards his dream and while doing that, he is constantly creating work for himself. When not working at a full time job, raising his young children or researching genocide, Winnipeg based video artist Rick Fisher makes videos over extended periods of time. After undergraduate art school, he worked underground in a mine for ten years. He subsequently worked at video artist run centers on the Canadian prairies for twenty years. His artwork has manly elegance as he explores themes of humanity and darkness. Don Rice is a digital media artist based in Winnipeg. Rice has created work in the mediums of video, world wide web, print, audio, cd rom, performance and photography. The main body of his work is in video, mainly with fellow prairie artist Rick Fisher. How do computer algorithms used in face detection applications on smartphones, Facebook and Google actually know what a face is? They learn it from faces datasets that were solely created to train these programs. From the program’s perspective these portraits are so to speak the blueprint for all our faces. In the video «Double Make-Up» Stefan Hurtig uses these databases’ pictures along with other visualization imagery as a backdrop for a video performance. Being inspired from Bruce Nauman’s 1967 video «Art Make-Up» the artist applies various camouflage patterns to his skin. As the video proceeds he gradually erases his own image from the screen. Stefan Hurtig a video artist based in Leipzig and Berlin. 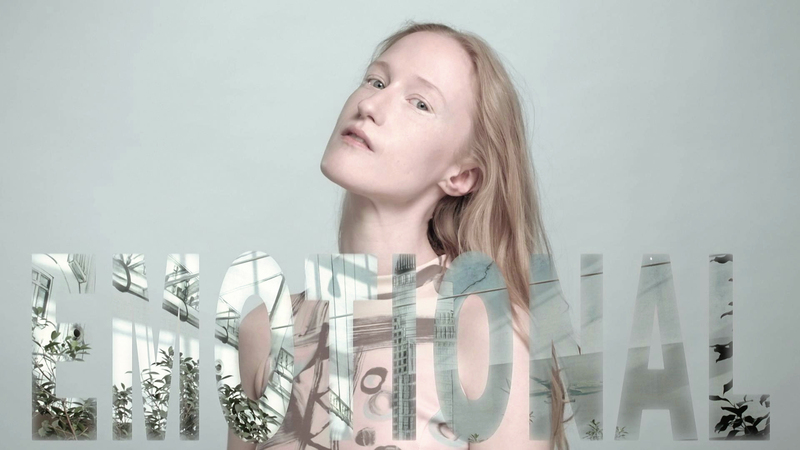 Hurtig’s video performances and installations fathom the influence of digital image culture on our conception of the self. Methods of sampling, remixing and reenacting images, language and text characterize this interdisciplinary approach. A line parallel to the horizon is coming out of the mist. It is getting closer and closer into view. The boundary between the visible and the invisible is becoming tangible, like a line you can grasp and take homeward. Linda Lenssen is an artist based in Oirlo, The Netherlands. In her works, she departs from her fascination for concepts like ‘fulness’ and ‘presence’. The desire to attain these matters can never be met and always remains at a distance. Her works can be seen as moments in which the principle of the difference is solved and we can forget ourselves for a moment. A satirical film told through the perspective of a religious fundamentalist. All of mankind is punished with a great flood except for one old man with a boat full of zoo animals. Religion plays a key role in climate change denial. Michael Mallis currently lives and works in New York City. His work has been shown at festivals and art galleries throughout the world. With the hand stretched out the artist is holding a smartphone in front of her face. The smartspone is turned on “App-of-existence-camera-mode”: usually the smartphone camera would show the artists face. This time not. The “app of existence” makes the user disappear to offer him or her a break of nothingness in the middle of the high flood of digital images. Johanna Reich is an artist living and working in Cologne, Germany. The video is a loud scream in the deafness of a country which hasn’t taken any law against homophobia and transphobia attacks or discrimination for sexual orientation and gender identity yet. Roberta Orlando develops her artistic research through video, photography, performance and sound. A big part of her works is dedicated to social, cultural, environmental and political issues, human rights and equality in particular. She works with visual and performative arts in Europe and USA. In Kukkuu a construction worker builds a high-speed forest in the corner of a white room, and finally becomes part of the landscape. Pia Sirén is a Finnish artist working mainly with sculpture and installations. She builds vast spatial landscapes using common construction materials. “Feedback: I<3U“ is time lapse footage of an online meta-performance held on Instagram. Skorpio posted screen captures of his profile page’s image grid recursively, until the images appeared as grey blocks. He lost at least 3 followers during the process. Niko Skorpio works mainly with sound, video, photography and miscellaneous stuff and activity. He has previously worked in graphic design and experimental music. “O” is a part of Not Ready Yet project of 2012, a collaboration between Willem Wilhelmus and Tomasz Szrama. “O” pictures a full cyclus in twelve phases. SADNESS IS AN EVIL GAS INSIDE OF ME is an absence of present, set in a future that holds an infinite potential for manifold pasts, pasts that show through the subconscious that determines the objects and spaces that shape this ambiguous future: escalators, pastries, parking lots, microwavable popcorn, highways, deserts and shopping malls. The series offers little of the spectacle typically inherent to its form. There is almost no spoken dialogue, unless it is for instance part of a commercial break that has managed to bleed into the fabric of the video piece. Instead, a set of disembodied voices leads us through mysterious events with quicksilver charm. “A single moment of true sadness connects you instantly to all the suffering in the world,” one of the voices quotes Chris Kraus. Yet in a tomorrow that might as well still get cancelled due to lack of demand, the hungry bodies that populate it avoid conventional interaction. Connections are appropriately interior in a world of surfaces. In SADNESS IS AN EVIL GAS INSIDE OF ME, Stine Omar and Max Boss use video as its own form of writing, where images juxtapose, irritate and enhance the spoken word; where the unsayable finds shape and expression. It is a soap opera in the guise of an essay film, or an essay film in soap opera drag. Its main characters are in a constant state of transition, from Mersad towards Yung Corn and from Holidays Bossi to Max, their distant bodies moving rhythmically in isolation. It is an introvert’s soap opera, where conflict, drama and romance aren’t acted out but instead reflect in the brain like the after image of a strobe light. Stine Omar and Max Boss are Berlin-based artists creating under the name of Easterjesus Productions. Their sonic identity is bolstered by a playfully clinical visual language – their numerous self-directed music videos show the sophisticated DIY aesthetic they have crafted, equally suitable for laptop screens as in white cubes. Sunday, April 17, 2016: 3.30 p.m.